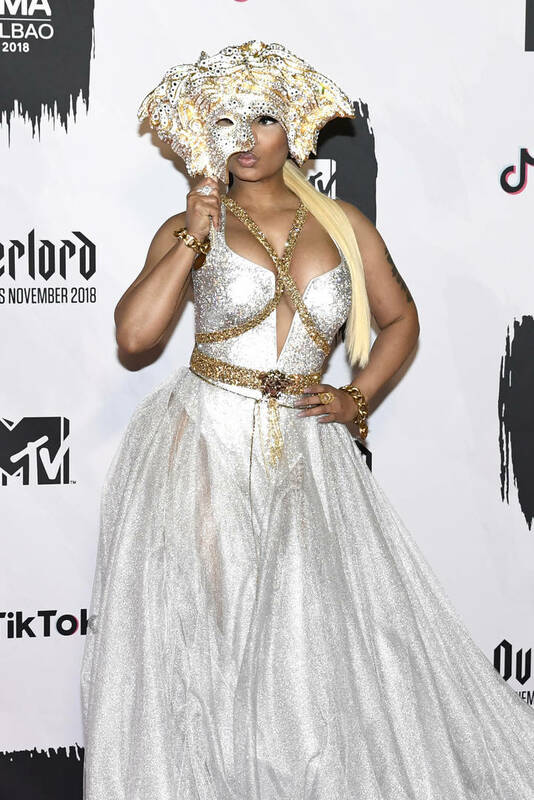 Home>Music> Nicki Minaj Wears Extravagant Bridal Outfit Inspired By A "Victorian Hovercraft"
Nicki Minaj continues to tease a potential stop-n-go wedding with her boyfriend Kenneth Petty, even though as early as last week, she went out of her way to quash those rumors. TMZ ran a report falsifying those rumors right as Nicki Minaj was scrapping together a composite image depicting Petty and herself at a younger age. Evidently, Nicki and Petty were high school sweethearts, but as fate would have it, their romance would be crushed at the stem by an adherence to the grind - Petty learning the wiles of the Devil, Nicki Minaj becoming a Devil incarnate herself. They would forever be intertwined. Nicki's allusions of a puppy romance, although endearing to no end, don't suffice as evidence of a marriage proposal. On the other hand, Nicki Minaj is giving her fans every reason to believe that a proposal is being discussed inside their pre-marital compound. Just yesterday, Nicki Minaj was in Zurich, Switzerland attending an event, (non-tour-related) where she campaigned in a makeshift bridal outfit. The above Instagram post showcases the outfit in all its splendor. Nicki's gown certainly pre tells an antiquated lust for a lavish ceremony, the veil covering her face is as Masonic as it gets. To top it all off, Nicki continuously refers to Petty as her husband whenever given the chance. MUSIC Nicki Minaj Wears Extravagant Bridal Outfit Inspired By A "Victorian Hovercraft"